“Sativa” versus “Indica” Doesn’t Matter. And Strain Names Too. Three movements underway are reshaping the definition of Sativa, Indica and Hybrid. Explore how this will change recreational and medical cannabis around the world and what role terpenes may play. Ever thought “this indica doesn’t make me sleepy” or “this sativa made me tired”? You’re not alone. If you follow respected cannabis periodicals or belong to a cannabis-oriented Meetup you likely already know that there is very little, if any, truth behind the commonplace interpretation of “Sativa” and “Indica”. Heylo has never put the words “Sativa” or “Indica” on our packaging, but we weren’t the first ones to recognize the inefficiency of these words. "You cannot tell the effects a plant will have based on its shape—the shape of its leaflets, its size, or how tall it is," Russo said. "What we really should be homing in on is the chemical composition of the plant." 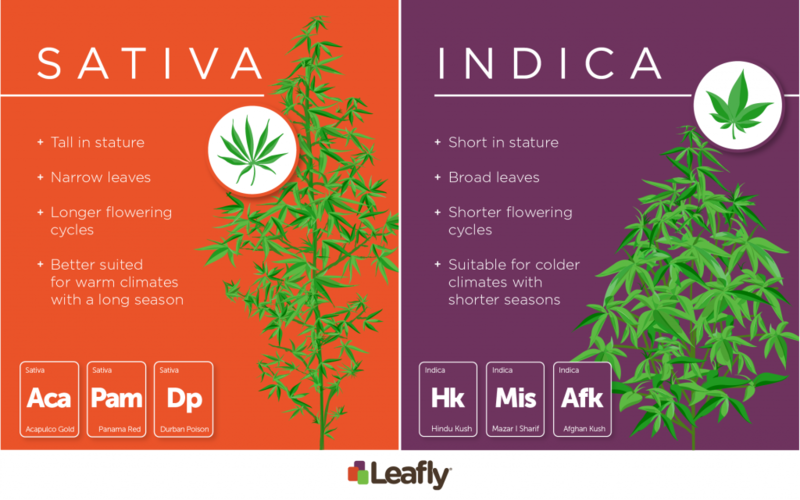 Even Leafly, which built a business out of categorizing strains into “Sativa”, “Indica”, and “Hybrid” categories, has entirely transformed the way they define these two words. Notice the graphic below describes nothing in the way of the anticipated effects of Sativa and Indica. Leafly began distancing itself from the “Sativa” vs. “Indica” debate as far back as 2013. That’s right, the Godfather of “Sativa/Indica” began recognizing its inefficiencies more than 5 years ago. VICE also took on the topic in 2017. They went one step further by dismantling the idea behind strain names. Indeed, strain names pose an issue on multiple levels. They have zero regulation and their properties will vary according to grow conditions. This leaves consumers having to sort through 100’s of names without even knowing if what they are ordering is real. Yet, despite this quiet transformation, the words Sativa/Indica/Hybrid rule most cannabis retail stores in Washington State, across the country and around the world. Consumers ask “what Sativas are in stock?”. Many budtenders initiate conversations with “sativa, indica or hybrid?”. Isn’t there a better way? There are several movements underway that are upending the commonplace definition of sativa/indica/hybrid. 3 Movements that are reshaping the definition of Sativa, Indica and Hybrid. Rather than try to abandon use of these words, many are changing the way they use them. Some budtenders refer to uplifting cannabis as “Sativa-like” and more sedating strains as “Indica-like”. A case and point of this redefinition is Heylo’s Jack’s Girl strain. This plant is genetically more like a indica in its appearance, origin and genetics. Yet it has extraordinary uplifting and energetic effects for many people. Hence, budtenders will refer to this strain as “sativa-like”. It may not be a sativa, but it aligns with consumer’s interpretations of what a sativa should be. What if we didn’t have to tell people how their cannabis purchase might effect them, and instead they could know by reading the chemistry of the product? This previously far-fetched idea is now closer to reality. Companies like Cannabinder and Strainprint are racing toward solutions that give consumers more power in terms of understanding what is in their cannabis. In the case of Cannabinder, the top 8 terpenes appear in a color wheel on the product and in the app. This allows consumers to compare and learn the chemistry of their cannabis without ever learning the specific names or percentages of common terpenes. The Cannastamp is now on all Heylo PAX ERA Pods in Washington State. Mention terpenes to a cannabis user 10 years ago and, unless you were smoking with a chemist, you’d get a puzzled look. Today that has all changed. In recreational states like Washington, consumers are entering retail stores asking for terpene information and products that display a specific terpene dominance. This goes hand-in-hand with the embrace of “rare” or minor cannabinoids such as CBC, CBG and THCV. These cannabinoids open the door for vastly different experiences with cannabis that do not fit the realm of Indica/Sativa/Hybrid. They are helping shatter previous conceptions about the effects of cannabis and we are only at the beginning of our understanding of their potential. It’s an exciting and at times confusing era to be in the cannabis industry or to consume cannabis legally and recreationally. This confusion, however, is representative of the opportunity before all beneficiaries of cannabis and the potential it has to reshape our world. Redefining and minimizing the use of the Indica, Sativa and Hybrid terminology is a critical step toward better, more consistent experiences with cannabis. Consistency is critical to the acceptance of cannabis by medical professionals, and we all stand to benefit when we create more positive and medicinal plants and labeling. A note from Heylo - We're working hard on our website to demystify cannabis chemistry and to make it easier for users and patients to find the right cannabis for their bodies and minds. Check out full analytical profiles, playlists, terpene information and more on our strain pages.